The Venture Pro is a full sized canister vacuum cleaner from one of the biggest names in the industry. Oreck has been building vacuums for more than 50 years, having established their brand as one of the best for both commercial and residential applications. It’s no surprise that homeowners consistently give them very positive reviews since they were originally designed for professional cleaners. That same quality has carried over into the Venture Pro which is purpose built to handle any floor in your home. It works just as well on tile, linoleum, and hardwood as it does on carpeting which is a huge plus since most modern households have a variety of floors in them. Canister vacuums have become much more popular with homeowners over the past ten years. Anyone who uses one quickly realizes just how versatile they can be, especially on smooth floors and furniture. This is largely due to their design and available attachments for the extension wand. Canisters are much easier to use on hard floors because most of their weight is not concentrated directly over the power head. You can usually just attach the floor tool (with no spinning brush roll) and start vacuuming without the worry of damaging the delicate surface. Sure you can do this with an upright but it is not as easy, nor is it as effective. A canister vacuum is designed for all types of floors but they especially thrive on smooth surfaces like hardwoods and tile, or on lower pile carpets. The Venture Pro from Oreck is no exception as it comes with their multi-floor attachment with finger tip suction controls. You can dial the power way back and then turn it up to max as you transition from rug to hardwood and back again. And for those floors that you are worried about damaging you can use the included hard floor brush with no spinning brushroll. If there is one thing that an Oreck vacuum is known for, it’s having a high quality filter installed. As mentioned above, since they got their start in the professional cleaning space they really had to have the filtration that could stand up to countless hours of use. Not only do you need a cleaner that can physically remove debris but you also need one that can remove those microscopic things that you cannot see. Allergens like dust mites and pet dander lurk in your carpet’s fibers and can only be removed by a top rated filter like a HEPA. In fact, according to the American Lung Association, cutting down on indoor air pollutants is very important to your overall health. The Venture uses bags to fully seal in the dust with no chance of escape. When combined with their filters, you end up with a completely sealed unit that removes 99.97% of the smallest of organisms down to 0.3 microns in size. For comparison sake the average stand of hair is around 50 microns in size and a typical dust mite can be about 400 microns. It is easy to see that hardly anything will be able to pass through the machine and back into your home. The Oreck Venture Pro is a high quality, full sized canister vacuum that is designed to handle all types of floors. 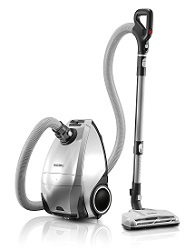 The Multi-Floor power head can deep clean for the most part but will struggle a bit on thick or shaggy carpets. For anything from medium to low pile as well as hard floors, it is one of the best choices out there. The filtration is very highly rated for today’s standards and the machine itself is constructed to last for 10 years or more. It’s not a cheap, throwaway machine but rather an investment into the indoor comfort of your home. You will be amazed at how quiet it is as well, even when operating under the highest power setting. The added insulation around the motor and overall design of the body really helps dampen the sound. It’s also quite compact and light, weighing in at just over 20 pounds total. For more information including current pricing and shipping options, click here to visit our recommended eCommerce store. It is typically in stock and can arrive within a couple of days.